The fashion industry — the runway shows, fashion week parties, and giant closets full of every color of shoe imaginable all seemed glamorous to me from a very young age. At age 8 I enrolled in fashion design classes, and after learning how to sew from my grandmother, began to bring my designs to life. Fast forward to my senior year at Parsons School of Design in New York City and I quickly learned the industry isn’t always so glamorous. My all-nighters in the studio hunched over a sewing machine, my unpaid internships, and that time when I sewed the sleeves on my jacket backwards were the reality of a fashion design degree. Despite all this, I loved creating something in my mind and making it reality with my own hands. 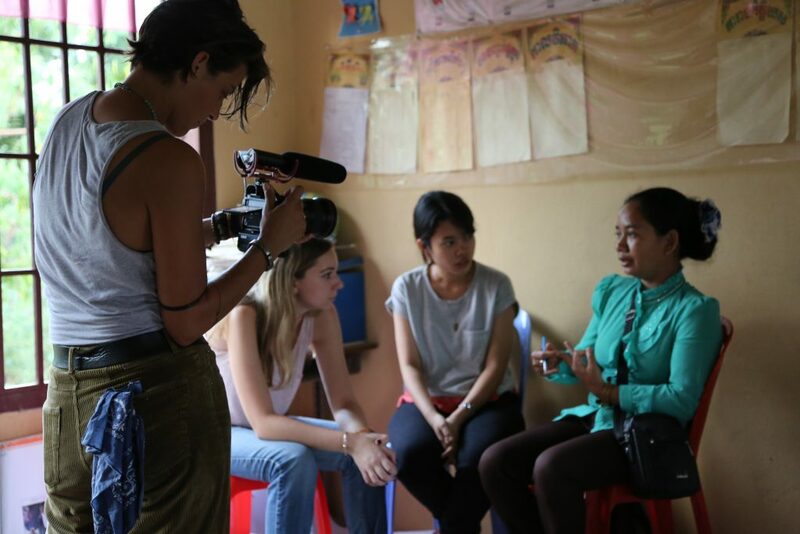 I had just started to work on my senior thesis, when applications opened to travel to Cambodia to meet the women who make the clothes we wear and design. 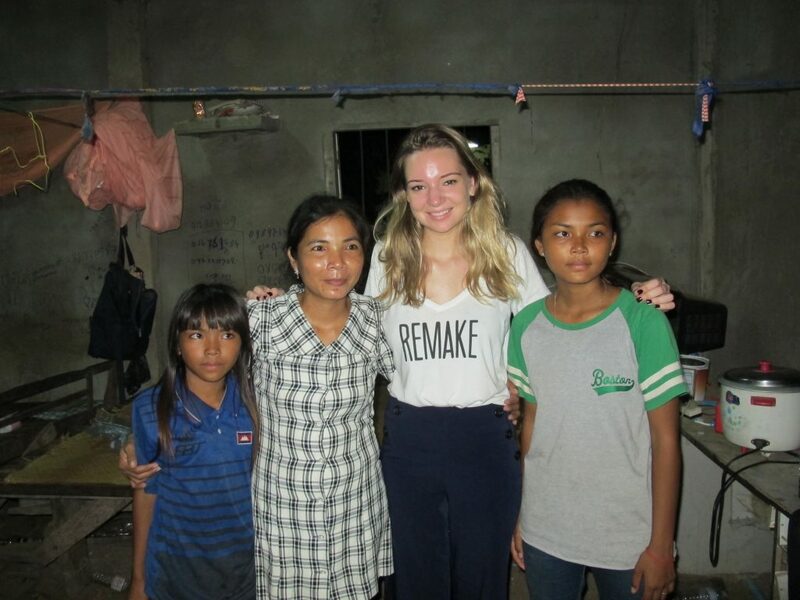 I was grateful to be one of the three students selected, and so with Remake’s team and my classmates, I went behind Made in Cambodia into the garment making communities who would some day bring my work to life. I was honored to have the opportunity to travel to Cambodia with Remake. The journey truly was eye-opening. We saw what good looks like visiting women who work for tonlé, a conscious fashion brand. We visited a large denim factory that produces for every imaginable American retailer to understand the human effort behind mass production. We also met women who work in the worst sorts of factories. I listened to their stories, visited their homes, and shared meals with the makers of our clothes. I listened to Char Wong’s story of working in garment factories in order to give her children a better future. 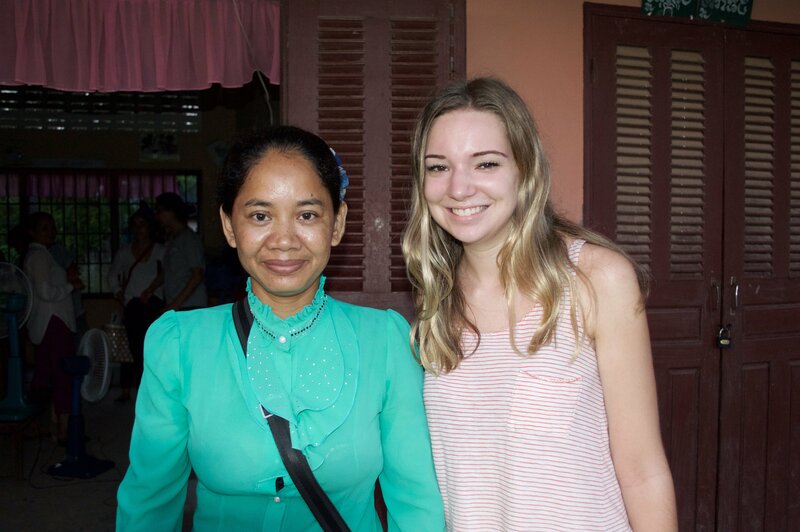 Sreyneang and her family opened their home to us and we all shared a meal together. 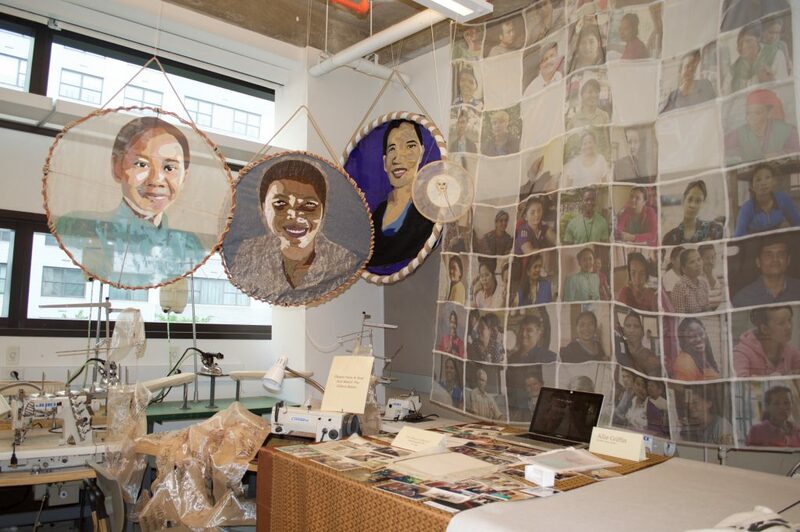 From this journey, I decided to change my senior thesis into a celebration of these women. 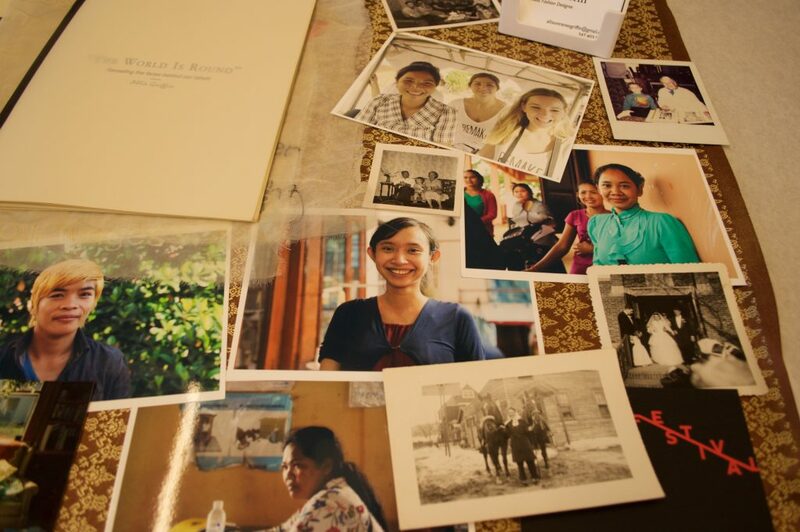 For my senior thesis exhibit, I printed photos of the makers I met on the Remake journey in Cambodia and put together a book of their stories. I saw the faces behind the statistics on garment makers and I learned that they have the same hopes and dreams that we have. They work hard so they can give their children a better future, just like my own parents. I decided that my thesis needed to bring these stories back, to change the narrative of garment factory makers by humanizing them. To show the faces behind the label, and celebrate these women as our sisters. I created a quilt (hanging right) of all the markers we met in Cambodia, as well as makers from other countries that Remake has visited. 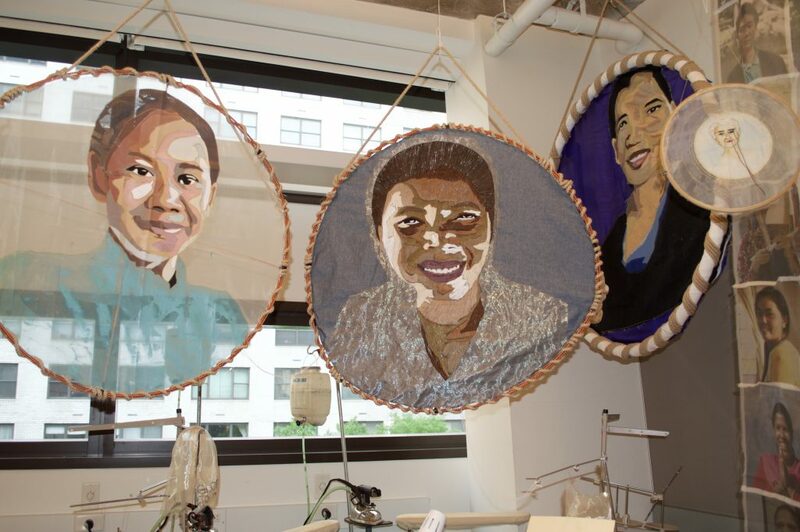 I left empty squares of transparent organza for the viewer to place their own face behind. The meaning behind this is that we are all one. We are all connected. We all share the same hopes and dreams. I also created four portraits of makers, including my great-grandmother who was a sewer at a factory in the 1940s. 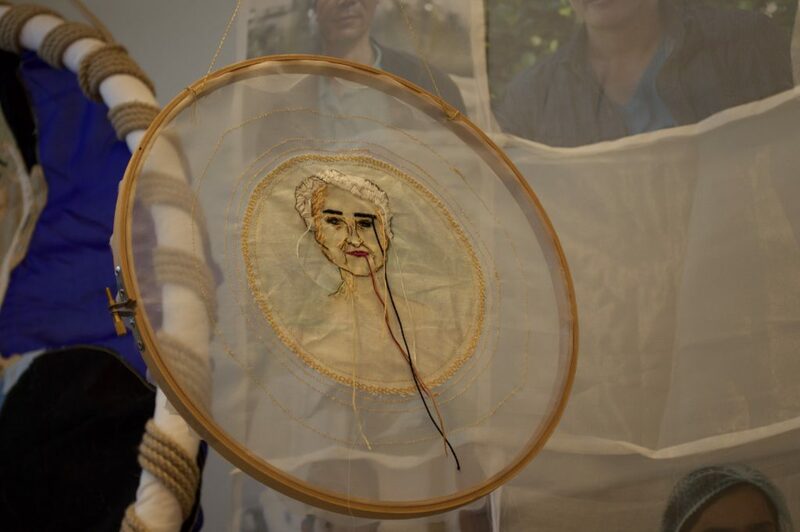 I took the photos of three different makers from Cambodia and created digital illustrations of each woman and then turned those illustrations into textile pieces. One woman, Char Wong worked at a subcontracted factory, who are often the most invisible workers. I painted her portrait (pictured on the left) with acrylic paint onto organza fabric to make her visible. 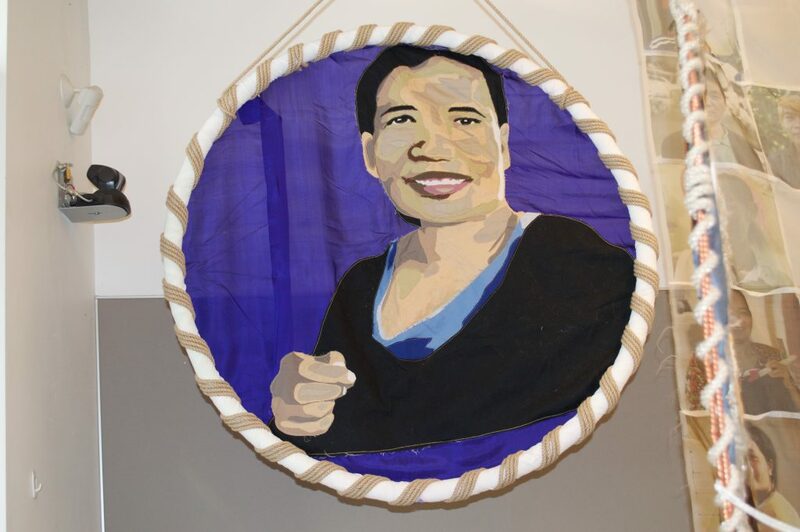 I used an applique technique to create a fabric collage portrait of Ming Eng, who worked at tonlé, a conscious which makes clothing from leftover fabric scraps. The blue background fabric is Cambodian silk I purchased while on the Remake trip. I embroidered a portrait of Sreyneang because she works at a denim factory where she sews piece-meal, repeating the same stitches over and over all day long. 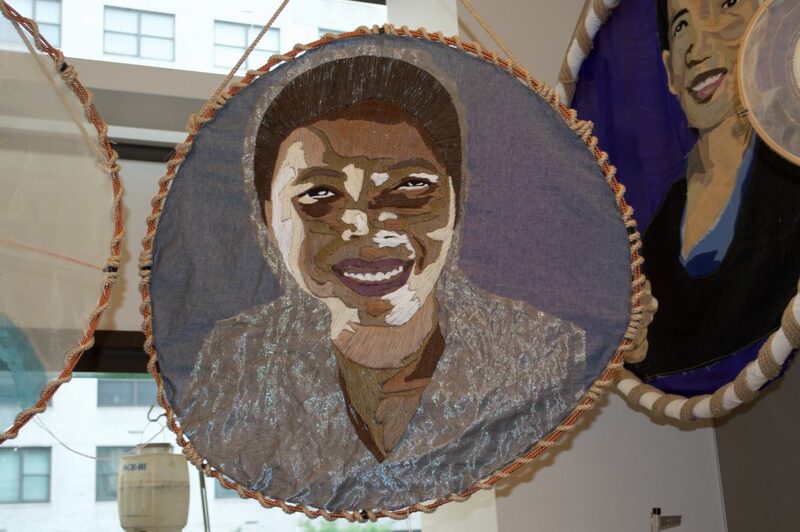 I stitched her portrait onto denim chambray fabric I bought from a remnant fabric market in Cambodia. All the techniques I used involved many hours of hand work to counter the fast fashion movement. Lastly, I wrote and produced a video (below) to spread awareness about the issues within the fashion industry. I’m going to think differently about the women who make the clothes I design, to consider their well-being from the beginning of the creative process to the end product. I will advocate to my colleagues the importance of choosing a factory that practices ethical treatment of its makers. I will teach my future colleagues and customers that these women are not victims, but rather strong inspirational women who are fighting for their own rights and pay — women worth celebrating.